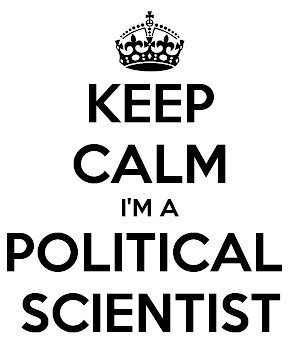 Where does your passion for political science come from? Any influence from your mom or dad? That is an interesting question, and one without a simple answer, honestly. I guess you could say it has a lot of sources. First, I wasn't ever particularly normal as a kid. I was a nerdy kid; I loved to read, had a difficult time expressing myself in words (I had significant learning differences - I didn't think like most kids, I had serious speech problems, and I had, but didn't know how to express it till college, synesthesia), and I just didn't fit in very well with my peers. So, sometime late my freshmen year in high school, I realized that I could study people, just like I had learned to study trees and birds and fish, and observe their behaviors, figure out what normal people did, and then start imitating them. I never did it perfectly (and still don't, as anyone who knows me can attest) but I became far more socially acceptable in relatively short order, so that I would consider myself "popular" by senior year of high school. This conscious effort to understand the norms and behaviors of my friends and peers was pre-scientific in that it wasn't systematic, but it was also very comparable to what social scientists do. Weird, I know. Secondly, my Mom, Margaret Gatherum Smith, was not a very political person - she was informed, but she was much more interested in doing good on her own. But she was a devoted moralist - she thought about theology and religion quite a bit and deeply invested herself in not only public service but in teaching and inculcating young people, my brother and I especially, with a deep sense of ethics and personal responsibility. And she never told me what to believe - this is very important to know. She insisted, rather, that I commit my person and my mind to the search for self-improvement and public service, to find the truth of humanity, existence, and Providence in my own way all while being very open and forthcoming about her own faith. She made my theologically a Wesleyan and accepted, from the very earliest days of my childhood, when I disagreed with her on tenants of faith, so long as I always knew that all human beings were equally deserving of my respect, service, forgiveness, and love. I miss her very much, and I try to honor her by imitating her as well (and admittedly imperfectly) as I can. She made me a theologian and a philosopher and those facts have deeply shaped my interests, leading me to be fascinated by minority and alien (to me) identities and peoples. She also strongly encouraged my artistic career which, while essential to defining me on my own helped me to become interested in propaganda, which eventually became the basis of my master's thesis and my deep appreciation of the role emotion plays in rational choice. Thirdly, my Dad is also not a particularly political person, though he has dealt with politics virtually every day of his professional life. Dad is a civil engineer, a math-guy, deeply logic-driven and ethically stolid. He instilled me with a sense of toughness, a profound ethic of self-improvement and public duty, and of the essential tenant that a good man does what is right always if he knows what is right, hang the costs to himself, and damn the politicians. I frustrate him, often, when we talk about politics, I know, because my dad is practical - he thinks adult human beings should be able to sit down, figure out what the problem is and then, like adults, figure out a solution and share the costs. That we don't astounds him. But dad does feel comfortable with science and history - the observed. You see something, you know it is real. Dad poured scientific information and method into me as a child and continues to as an adult (every time I visit him I seem to come home with another book he insists I read). He made me a lover of nature and an observer of its patterns - in other words, a scientist. I can't tell you the number of times he would teach me about the habits of fish, the nature of trees, the subtle lessons in evolutionary biology and geology and geography. He is brilliant. And the history? My god, Dad made it is mission to teach me about my history - especially American history. Pirates? Check. European Colonization? Absolutely. Military history? Are you kidding? The Revolutionary and Civil Wars? Ad infinitum. Dad bought me books, showed me documentaries, took me battlefields, museums, graveyards, archaeological digs, and historical recreations (and he still does). Dad made me love history and science, and the natural combination, it seems, is an obsession with politics and, of course, politics by other means - war. Fourthly, I had the rare pleasure of becoming politically aware at exactly the perfect time in history - I was 13 when the Revolutions of 1989 through 1991 began. Democratization went crazy. America fought the first Iraqi-American war. The Soviet Union fell. It was madness, beautiful, amazing, sad, happy, madness. And I fell in love. Fifthly, I read just the right books at virtually the same "just the right time." Most important of those? Ray Bradbury's The Martian Chronicles. I still consider this the best book ever written on the subject of imperialism and its consequences, the book that taught me both how lucky I was to be an American and the costs that had been paid and continued to be paid (some willingly, some forcibly, some admirable, some deplorable) for the privileges afforded me. If you haven't read it, please do. You will cry. Sixth, I was a Boy Scout. As part of my Scouting efforts I was required to get several merit badges on the subject of politics and citizenship - Citizenship in the Community, Citizenship in the Nation, and Citizenship in the World, and I followed these up by pursuing the American Heritage merit badge. These made me think long and hard about the fact that I was a member, simultaneously, of a lot of different identity groups, and that ethical choices for me must, insofar as possible, serve them all. Seventh, I had the blessing of a tremendous liberal arts education at Emory & Henry College. I read enormous quantities and wrote equally insane amounts. I studied every field of human endeavor, including some I was, frankly, far from interested in at the time. I was able to major in Political Science, of course, but also in Art and Geography - my senior show in the former being about the intersections of politics and art, my senior thesis for the latter being on a political-geographic subject - and I nearly stayed one more semester for a fourth in theology. I participated in and was president of the student government, a micro-state but a state nonetheless, and I was a member of that most formative of political schools - a college fraternity. There were other things that probably warrant attention - Dad taking me for visits to VMI; learning both what it means to win and lose a fight; my fervent desire to leave the US a little better than I found it; my despair at the ignorance and hate that I so often see around me; my rage at the way Appalachia has been exploited and pillaged; and my simple love of the beauty of difference and diversity of cultures and institutions. And my students. The kids. My kids. I love my kids. But I just wouldn't know where to start on the rest.